Xanana Gusmao has resigned as prime minister. 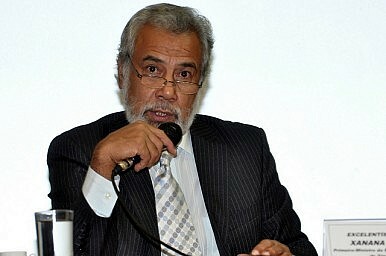 Xanana Gusmao has been the face of East Timor since independence. As a former resistance fighter he led the movement for independence, which was finally successful in 1999. Since 2002, Gusmao served in numerous roles in government as both president and prime minister. On February 6, he tendered his resignation as prime minister. Gusmao’s resignation, accepted this week, leaves president Taur Matan Rauk to restructure the government and appoint a new prime minister. His successor will be the former health minister Rui Araujo. Gusmao joined Fretilin, the Revolutionary Front for an Independent East Timor, in 1975. For a week of that year the country was independent as the Portuguese exited their former colony. Days later, in a revolving door of occupation, Indonesia invaded. So began nearly a quarter of a century of violence and rebellion. As the guerillas waged war on their new adversaries from the jungle, Gusmao rose quickly through the ranks. In 1981 he led Falintil, the Resistance’s military arm. After bringing international attention to a massacre by the Indonesian forces in 1991, he quickly topped Jakarta’s most wanted list, only serving to further his appeal to local Timorese. Winning the presidency in a landslide in 2002, Gusmao negotiated the country’s post-conflict factional violence and sought stability as prime minister from 2007 to 2012 under president Jose Ramos-Horta and his successor Rauk. Along with Ramos-Horta, Gusmao played a major role in supporting the decision by the joint East Timor-Indonesia Commission on Truth and Friendship to champion restorative over retributive justice (an excellent account of this process of justice in East Timor is here). This was made more significant by the 2006 Chega! (Stop!) report that catalogued gross human rights abuses and crimes against humanity under Indonesian rule. Still, a policy of restorative justice was upheld. Acceptance of restorative justice and the development of relations with Indonesia were divisive policies, both locally and internationally. Yet both allowed for the building of relations with the country’s biggest neighbor and most important trading partner. Moreover, both policies permitted the country to look forward instead of back. Gusmao’s critics note his often strong-arm governing style and East Timor’s slow growth under his leadership. Indeed, despite large gas resources the country has languished in its development, its 1.2 million people remain among the poorest in the world. With a median age of 18 years and more than 40 percent of the population under 14 years old (and therefore born after independence), Gusmao is right to step aside and let a new generation take the mantle of leadership. A generation that is unshackled to past conflict should be ushered in. Now 68, Gusmao is revered by many as the father of the young nation. And that is a title he will hold well after his years in office. The country’s new prime minister appeals for unity and unveils some of his plans.